Two new studies, based on observations made with ESO's telescopes, show that objects only a few times more massive than Jupiter are born with discs of dust and gas, the raw material for planet making. This suggests that miniature versions of the solar system may circle objects that are some 100 times less massive than our Sun. These findings are to be presented Monday, 5 June at the American Astronomical Society meeting in Calgary, Canada. Since a few years, it is known that many young brown dwarfs, 'failed stars' that weigh less than 8 percent the mass of the Sun, are surrounded by a disc of material. This may indicate these objects form the same way as did our Sun. The new findings confirm that the same appears to be true for their even punier cousins, sometimes called planetary mass objects or 'planemos'. These objects have masses similar to those of extra-solar planets, but they are not in orbit around stars - instead, they float freely through space. "Our findings, combined with previous work, suggest similar infancies for our Sun and objects that are some hundred times less massive", says Valentin D. Ivanov (ESO), co-author of the first study. "Now that we know of these planetary mass objects with their own little infant planetary systems, the definition of the word 'planet' has blurred even more," adds Ray Jayawardhana, from the University of Toronto (Canada) and lead author of the study. "In a way, the new discoveries are not too surprising - after all, Jupiter must have been born with its own disc, out of which its bigger moons formed." Unlike Jupiter, however, these planemos are not circling stars. In their study, Jayawardhana and Ivanov used two of ESO's telescopes - Antu, the 8.2-metre Unit Telescope no. 1 of the Very Large Telescope, and the 3.5-metre New Technology Telescope - to obtain optical spectra of six candidates identified recently by researchers at the University of Texas at Austin. Two of the six turned out to have masses between five to 10 times that of Jupiter while two others are a tad heftier, at 10 to 15 times Jupiter's mass. All four of these objects are 'newborns', just a few million years old, and are located in star-forming regions about 450 light-years from Earth. The planemos show infrared emission from dusty discs that may evolve into miniature planetary systems over time. In another study, Subhanjoy Mohanty (Harvard-Smithsonian Center for Astrophysics, CfA), Ray Jayawardhana (Univ. 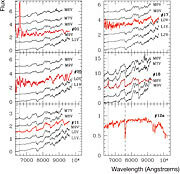 of Toronto), Nuria Huelamo (ESO) and Eric Mamajek (also at CfA) used the Very Large Telescope, this time with its adaptive optics system and infrared camera NACO, to obtain images and spectra of a planetary mass companion discovered at ESO two years ago around a young brown dwarf that is itself about 25 times the mass of Jupiter. 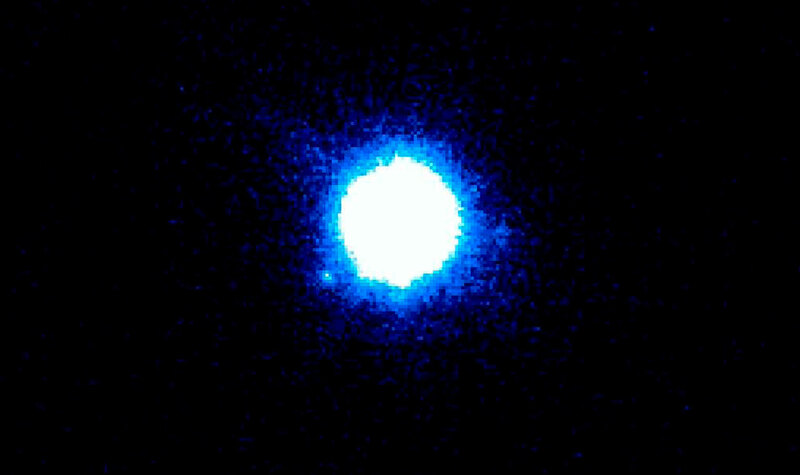 This planetary mass companion is the first-ever exoplanet to have been imaged (see ESO Press Release eso0515). The brown dwarf, dubbed 2M1207 for short and located 170 light-years from Earth, was known to be surrounded by a disc. 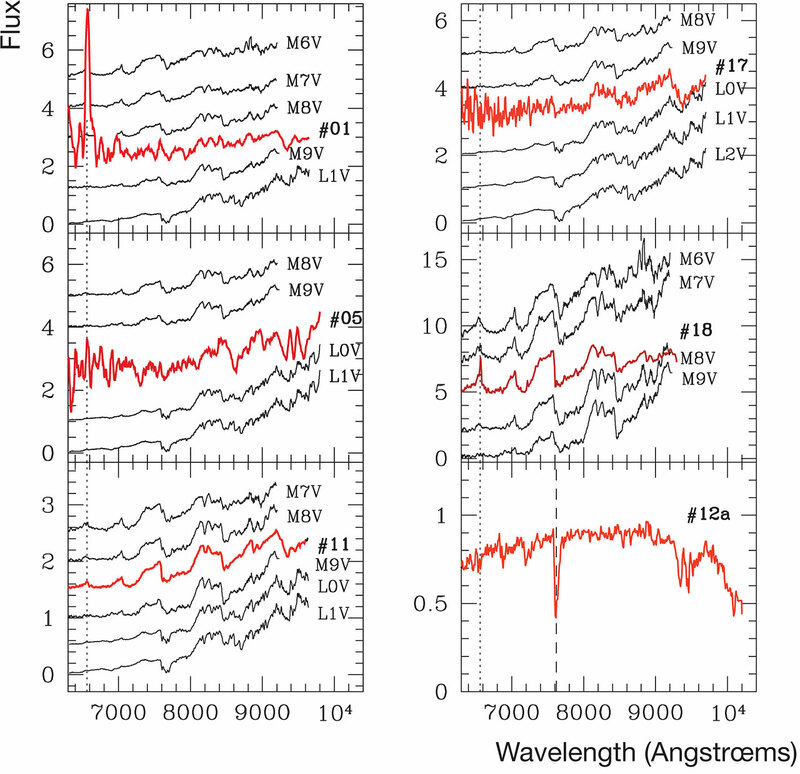 Now, this team has found evidence for a disc around the eight-Jupiter-mass companion as well. "The pair probably formed together, like a petite stellar binary", explains lead author Mohanty, "instead of the companion forming in the disc around the brown dwarf, like a star-planet system." "Moreover", Jayawardhana adds, "it is quite likely that smaller planets or asteroids could now form in the disc around each one." The recent discovery is the latest achievement in a long series of breakthroughs made with ESO's telescopes. The ESO La Silla Paranal Observatory, with its armada of instruments equipping the four 8.2-m telescopes composing the Very Large Telescope and the various telescopes in the 1.5-m to 3.6-m range at La Silla, is indeed very well equipped for the study of exoplanets, with instruments for adaptive optics imaging (NACO), high resolution spectroscopy and radial velocity measurements (HARPS, UVES, FLAMES, 1.2-m Swiss Telescope) and long term monitoring (1.54-m Danish Telescope). A list of the most recent of these achievements is given below. 2002: Discovery of a dusty and opaque disc in which planets are forming or will soon form, surrounding a young solar-type star. This disc is similar to the one astronomers think the Earth and other planets in the Solar System formed. For more details, see ESO Press Release eso0214. 2004: Confirmation of the existence of a new class of giant planet. These planets are extremely close to their host stars, orbiting them in less than two Earth days, and are therefore very hot and 'bloated'. For more details, see ESO Press Release eso0415. 2004: Discovery of the first possible rocky exoplanet, an object 14 times the mass of Earth. For more details, see ESO Press Release eso0427. 2005: Discovery of a planet of mass comparable to Neptune around a low-mass star, the most common type of star in our Galaxy. For more details, see ESO Press Release eso0539. 2006: Discovery of the smallest known exoplanet, with only five times the mass of Earth. For more details, see ESO Press Release eso0603. 2006: Detection of three Neptune-like planets, each of a mass between ten and 20 times that of Earth, around a star that also possesses an asteroid belt. Of all known systems, this is the most similar to our own Solar System. For more details, see ESO Press Release eso0618. 2006: Observations show that some objects with several times the mass of Jupiter have a disc surrounding them and may form in a similar way to stars. It thus becomes much more difficult to define precisely what a planet is. For more details, see ESO Press Release eso0619.